Here is few web sites where you can check your SSL certificate is installed properly. mirror: Fatal error: Host key verification failed. Certificate '/opt/zimbra/boby/zim_simplecloud_co_za.crt' and private key '/opt/zimbra/ssl/zimbra/commercial/commercial.key' match. I checked with SSL provider, they initially provided a combined SSL certificate, that have cert file + ca certificate. I tried to install it, but it did not work. After showing SSL support the screenshot of the SSL install page, they provided me with 3 differnt files. 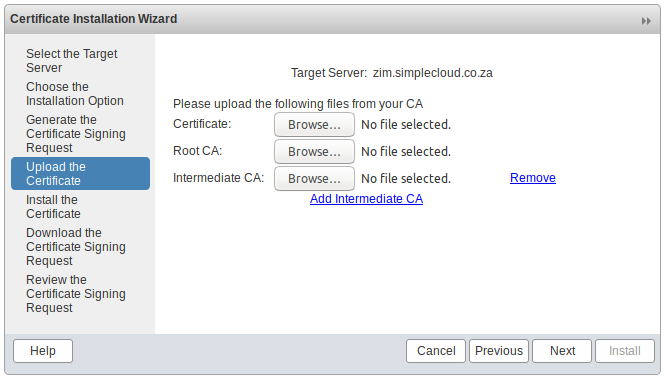 In the zimbra SSL install, you have option to add more intermediate CA by clicking “Add Intermediate CA” link. I tried to install it using UI, but it failed with some error related to RemoteManager and port 22. Pasted the SSL certificate content to this file. commercial.key file have the private key, this get auto generated during the CSR generation process. Certificate 'commercial.crt' and private key 'commercial.key' match. After few try, mixing ca certificate in following order got it work. Certificate 'commercial.crt' and private key '/opt/zimbra/ssl/zimbra/commercial/commercial.key' match. 'commercial.crt' and '/opt/zimbra/ssl/zimbra/commercial/commercial.crt' are identical (not copied) at /opt/zimbra/bin/zmcertmgr line 1278. 'commercial_ca.crt' and '/opt/zimbra/ssl/zimbra/commercial/commercial_ca.crt' are identical (not copied) at /opt/zimbra/bin/zmcertmgr line 1278. Now rebooted the server, after reboot SSL worked. If you use SELinux, you may need to configure it for each applications.